I hate to admit it, but today is one of those days when any project is an issue. Not enough sleep, feeling a little under the weather, I just can’t seem to find any inspiration. I looked through some old photographs in my computer and actually picked a few, but the truth is I’m just not up to it tonight. I promised art every day for a year, and as I have said in the past, there are days I just didn’t count on. Today is definitely one of them. I pushed through it last night when I wasn’t feeling well, but tonight I think I’ll be raising the white flag. The only thing that I’m finding inspirational at the moment is putting my head down. However, I have been raised on the ultimate force of power in the universe, otherwise known as Catholic guilt. When I make a promise, I keep it. I realize that there is no WordPress hotline to the Vatican that might report my missed deadline, but due to masterful parental manipulation, guilt rules my life. I wouldn’t dream of not following through when I say I’ll do something. I really was going to try, but in the not so far distance I hear my couch calling my name. Of course all of the above being said, I can’t answer the call of the couch until I post something. A simple watercolor. I hope to be back in fighting form tomorrow. 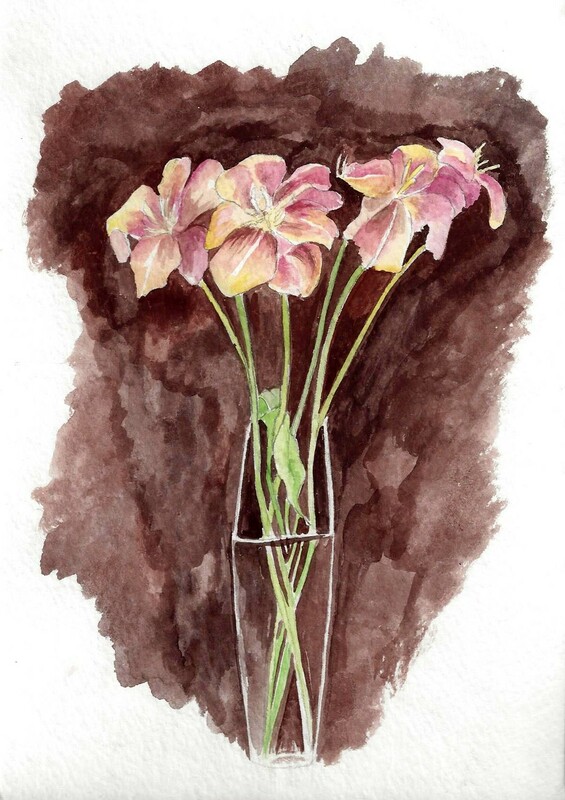 This entry was posted in art, Art and my life, Fine Art, Uncategorized, Watercolor and tagged art, drawing, Fine art, guilt, humor, illustration, life, painting, projects, thoughts, watercolor, writing. Bookmark the permalink.